Fares are per person based on double occupancy in a Yacht Club Deck 3 stateroom. A $25.00 per person non-refundable booking fee is charged at time of deposit. $1,100 per person deposit is required to reserve your space. September 10, 2018, a second deposit of $1,100 per person due. Final payment is due April 16, 2019. Aquamarine seas lap the shores of historical cities paved with cobblestoned streets and colorful avenues. We will be offering a 5-day pre-trip to The Douro Valley in Portugal, stay tuned for more details. Located in the heart of Lisbon, this historic hotel wears the cultural heart and soul of Portugal on its sleeve. Inside, art-deco sensibilities mingle with an updated Louis XVI style, and a collection of important contemporary local artwork fills the halls. Outside, views of the city’s rolling hills and brightly tiled exteriors spread out before you. Board the SeaDream I for your cruise! Portimao, Portugal is located in the District of Faro in the Region of Algarve. This is a great place for seafood restaurants with grilled sardines being the specialty. The beaches are very nice around Portimao, one of interest is ("Praia da Rocha"), meaning "Rocky Beach" . 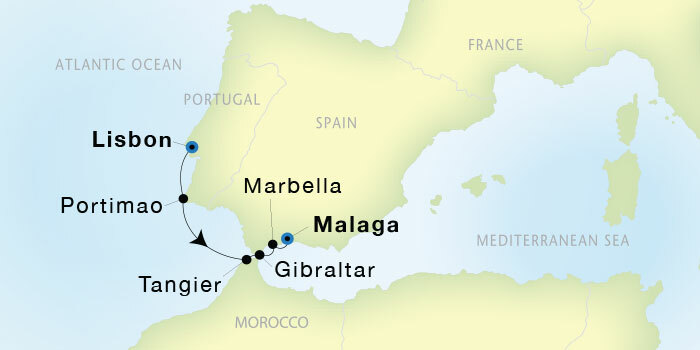 Tangier, the jewel of North Africa, is a dazzling city that perfectly blends the past, present and future, from the maze-like streets of the ancient Kasbah to the expansive modern coastline complete with palm trees that serve as wi-fi towers. Even as Tangier becomes ever more connected, it still maintains its incredibly rich traditional Moroccan culture. Gibraltar is a British Overseas Territory located at the entrance of the Mediterranean on the southern end of the Iberian Peninsula. Most visitors arriving by sea are impressed by the rock’s enormous visual impact. Only covering an area of 2.3 square miles (6.0 sq. km.) several sites are a must-see! Some of the “can’t miss” options include the Great Siege Tunnels, St. Michael’s Cave, The Moorish Castle, The Lighthouse at Europa Point and shopping – yes shopping. Puerto Banus is a very upscale marina to the west of Marbella, Spain on the Costa del Sol. It was built in 1970 by Jose Banus, a local property developer, as a luxury marina and shopping complex for the jet-set. The focal point of Puerto Banus is the marina. It is also a scene for many exotic cars that are owned by international celebrities and wealthy owners that also own large mega yachts. Malaga, together with adjacent towns and municipalities such as Rincon de la Victoria, Torremolinos, Benalmadena, Fuengirola, Alhaurin de la Torre, Mijas, and Marbella, forms the Malaga Metropolitan area. The important cultural infrastructure and the rich artistic heritage have culminated in the nomination of Malaga as a candidate for the 2016 European Capital of Culture. The internationally acclaimed painter and sculptor Pablo Picasso and actor Antonio Banderas were both born in Malaga.